I have a very good friend with a large garden. She recently shared some of her bounty with me. 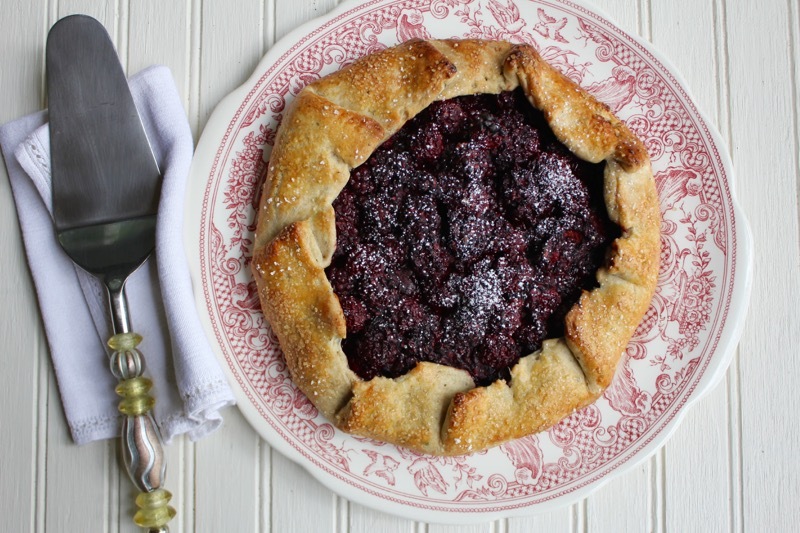 The blackberries were plump and ripe, so I made this amazing tart with a rosemary flecked crust. There is something about the rosemary that marries well with berries. I love making free form tarts. The rustic look appeals to me. These blackberries were juicy and full of flavor. When you use top notch ingredients you can’t go wrong. Enjoy this Blackberry Tart on a summer evening with ice cream, preferably on a screened porch overlooking a lake. Fireflies and screen doors add to the ambience. In a kitchenaid mixer with the paddle attachment or a food processor, mix together the dry ingredients. Add the cubed butter, and mix or pulse until butter breaks down into pea sized pieces. With the machine running or pulsing, add the ice water until the dough JUST begins to come together. Turn the crust mixture out onto some plastic wrap, wrap it and flatten it into a disk shape. Refrigerate for about 10 minutes while you prepare the filling. Throw all the filling ingredients into a bowl, and mix well so that that the sugar and flour coat all the blackberries well. Remove the chilled crust from the fridge and unwrap it onto a silpat or piece of parchment paper large enough to cover your baking sheet. Dust it with flour, then roll the dough out until it is between 1/8″ and 1/4″ thick. Spoon the filling and its juices into the middle of the crust and spread it out leaving a 2″ border of crust. Fold the border of the crust over onto the filling, leaving the nice rustic edges. Brush the crust with eggwash and sprinkle the crust with sugar. Slide the tart onto the silpat or parchment onto a baking sheet. Bake for about 40 minutes until crust is nice and golden. Posted on July 26, 2017 at 1:49 pm. “Anyone who thinks fallen leaves are dead has never watched them dancing on a windy day.” (Shira Tamir). The leaves are falling and the colors are changing to russet and saffron. Our roof is being bombarded with falling acorns. I even dodge them when walking the dog. I am literally being hit in the head with autumn. So naturally my thoughts turn to the foods of the season. When contemplating dessert I think of pumpkins and apples. 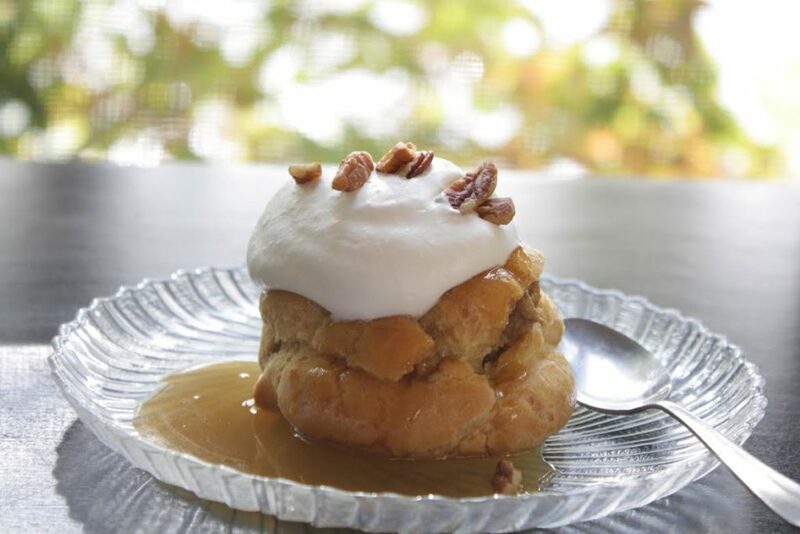 Last year my Daughter-in-law made Pumpkin Custard Profiteroles with Maple Bourbon Caramel for Thanksgiving instead of pumpkin pie. It was such a pleasant surprise. Last weekend David and I had the other Penny (of Enjoying the Simple Things) and her husband over for lunch. I made these delicious cream puffs filled with pumpkin custard, drizzled with a maple bourbon custard and topped with whipped cream and chopped pecans. I loved the fact that I could do everything ahead of time. It was just a matter of assembly before they were served. 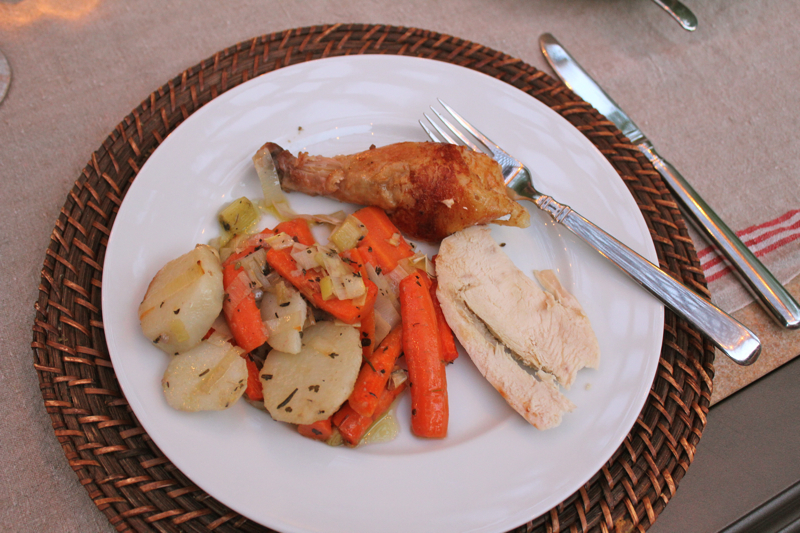 You can go to Penny’s blog for a snapshot of the whole meal that I served. You can find this dessert recipe here on Epicurious. I know there are thousands of apple pie recipes out there. But I came up with a winner with this one. 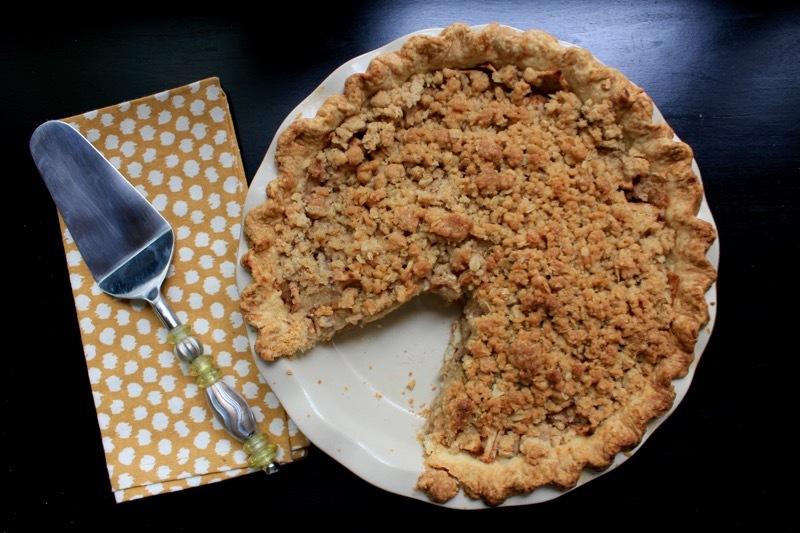 I combined several recipes for this Apple Crumble Pie. I was first inspired by Monique of La Table de Nana. She takes such beautiful pictures and just looking at her apple pie made me hunger for it. I used her tried and true pie crust recipe. For the apples and crumb topping I adapted Ina Garten’s apple crisp recipe. It was truly delicious. 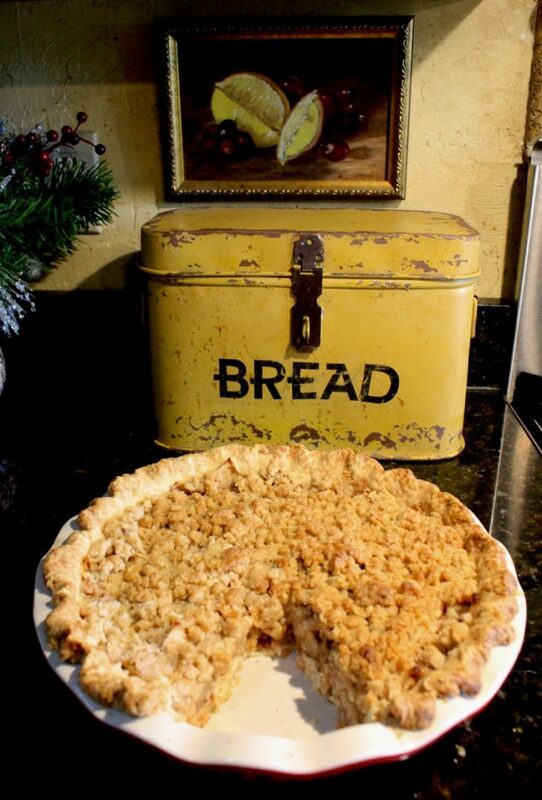 The pie crust was flaky, the apples a little on the tart side and the crumble topping crunchy and sweet. Don’t wait to be hit in the head by falling acorns to get inspired. In a food processor pulse the first 3 ings..cut up your butter and sprinkle on top of the flour mixture..pulse until coarse crumbs..through the feed tube w/ motor running add the water slowly until it starts to come together. Mine came out of the recipient so nicely..I just formed a flat disk on parchment..wrapped and refrigerated 30 minutes. After resting the pastry dough in the refrigerator for 1/2 hour, roll out into a circle to fit into a 9 inch deep dish pie dish. (There will be extra left. Save for future use.) Flute edges. Combine the sliced apples with sugar and spices in a large bowl. Let rest until juices start rendering. Toss well. Place apples into prepared pie dish. 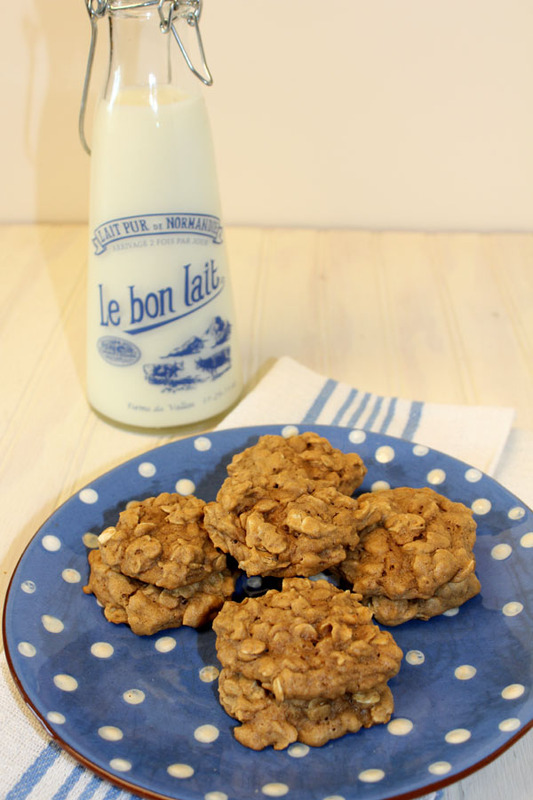 To make the topping, combine the flour, sugars, salt, oatmeal and cold butter in the bowl of an electric mixer fitted with the paddle attachment. Mix on low speed until the mixture is crumbly and the butter is the size of peas. Scatter evenly over the apples. Place pie on a baking sheet and bake for one hour or until the top is brown and the apples are bubbly. Serve warm. Posted on October 17, 2016 at 7:06 pm. There are so many reasons that blogging is a rewarding experience, but one of the major reasons is because you get to meet so many special people. Let’s backtrack a few years. When a started blogging in 2009 there were not many of us doing it. I put my blog out there and hoped that someone would find my voice interesting. I clicked on other blogs and found Penny’s blog. Oh my, same name. Oh my, born and raised in Michigan like me, Oh my, lives in North Carolina just 25 miles away from where I live. It was meant to be. I had to meet her. I wrote about our first meeting here. We have since become great friends. We had dinner at Penny and her husband’s home last Saturday. 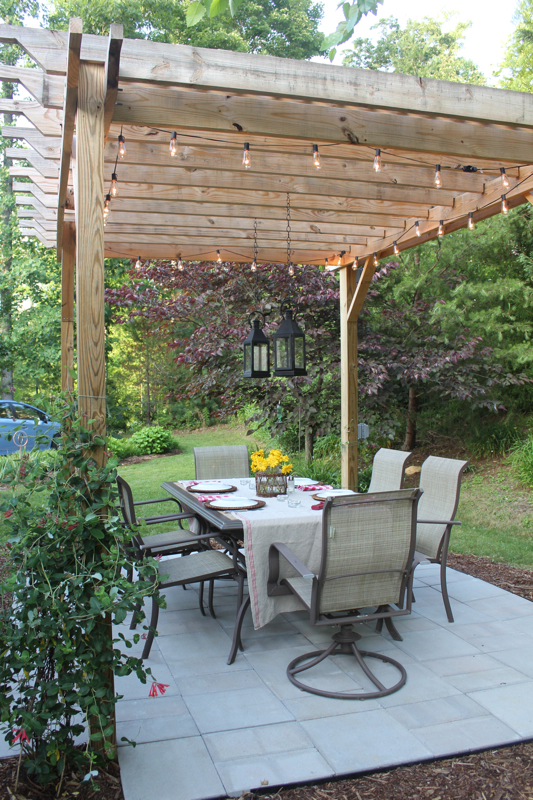 It was a lovely evening and we enjoyed dining al fresco under their new pergola. Penny is a great cook. Everything was delicious. Both Penny and I love Paris. 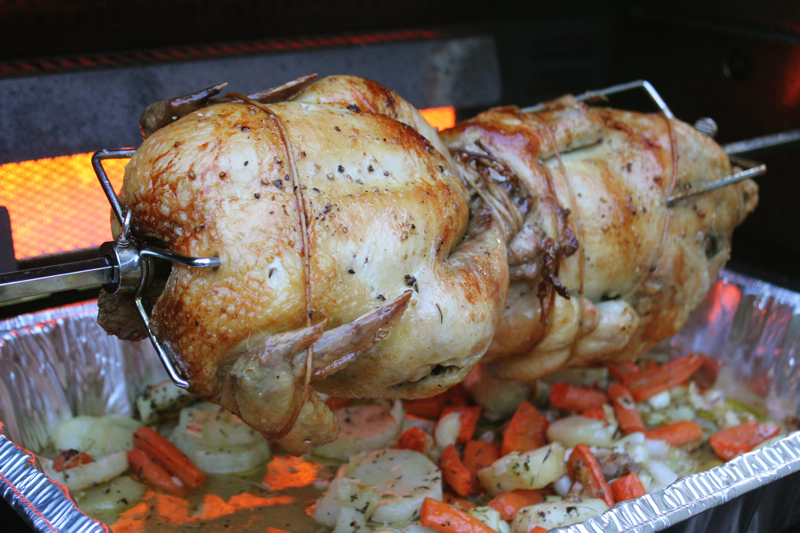 One of the delights of Paris food markets is the rotisserie chickens cooked over pans of vegetables. The chicken drippings flavor the vegetables as they braise. That was what she duplicated on their grill. That is a beautiful plate of food. It was a perfect meal for a summer evening. 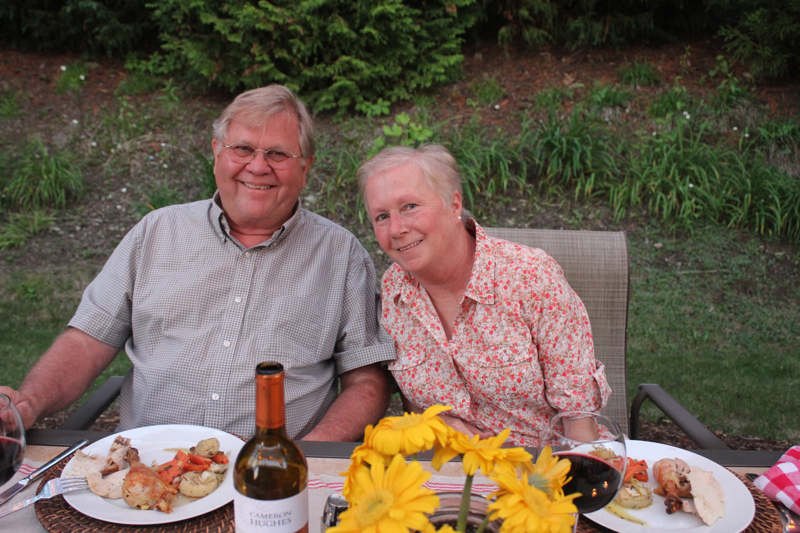 Here are our wonderful hosts, Penny and her equally talented husband. Because we have so much in common, it should have come as no surprise to me that what she served for dessert was the very same dessert that I had made the previous week for my next blog post. 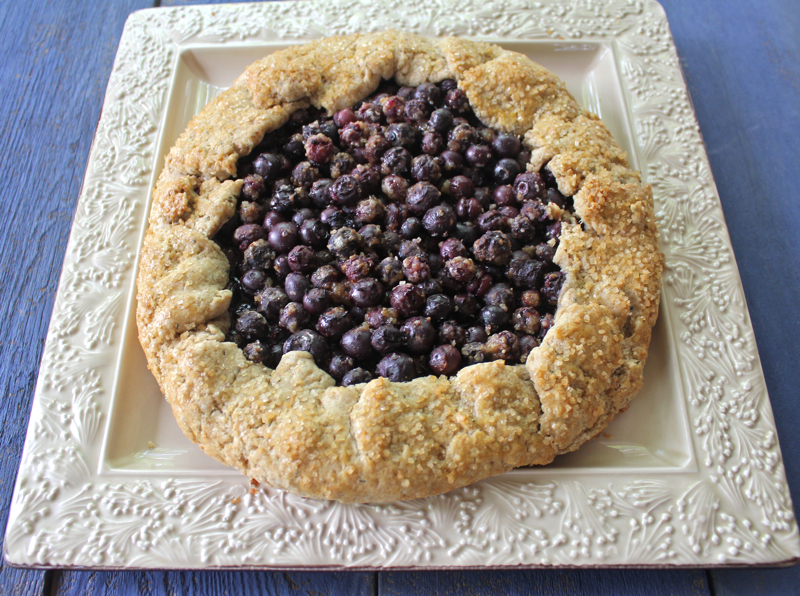 So although I did not get a picture of Penny’s blueberry galette, I had it covered with the one that I made. We are definitely on the same wave length. I made this blueberry galette as part of a recipe testing exercise at the Food 52 website. The editors of Food 52 pick worthy recipes that are submitted to their contests for other members to test and rate. I chose to test this galette because of the uniqueness of the crust. It incorporates rosemary and whole wheat flour into the pastry. I LOVED it. 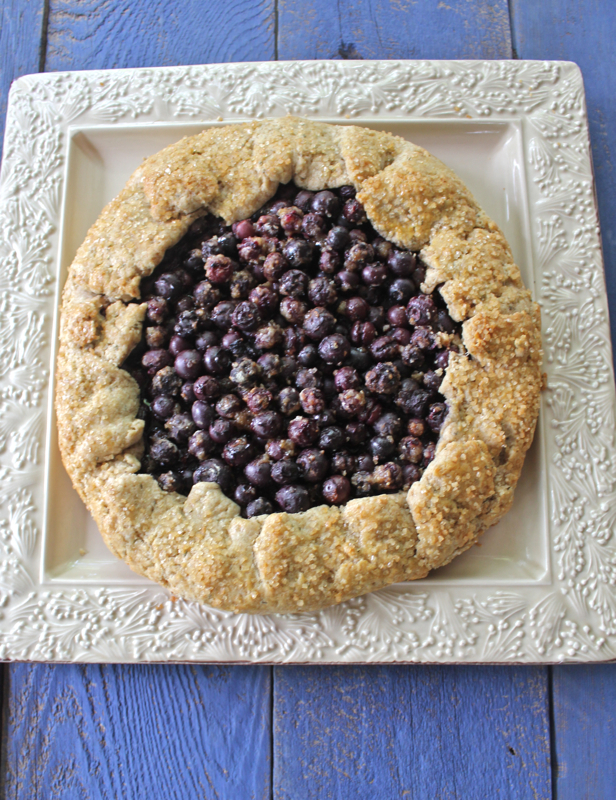 The pastry was easy to handle and the rosemary went so well with the blueberry filling. 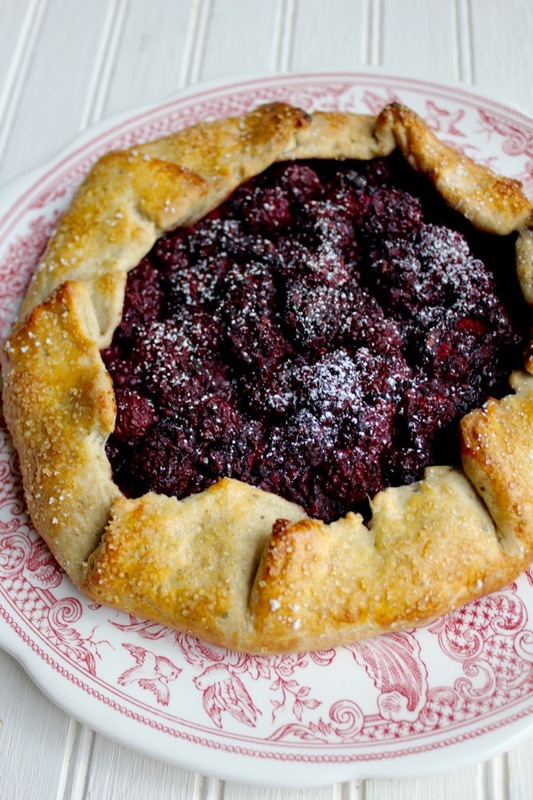 The turbinado sugar just added to the rustic simplicity of this galette. It will be repeated often in my kitchen. Give it a try. Thanks Penny and K for a great evening. Throw all the filling ingredients into a bowl, and mix well so that that the sugar and flour coat all the blueberries well. Brush the crust with eggwash and sprinkle the crust with sugar. Slide the galette on the silpat or parchment onto a baking sheet. Posted on June 16, 2014 at 9:47 am. 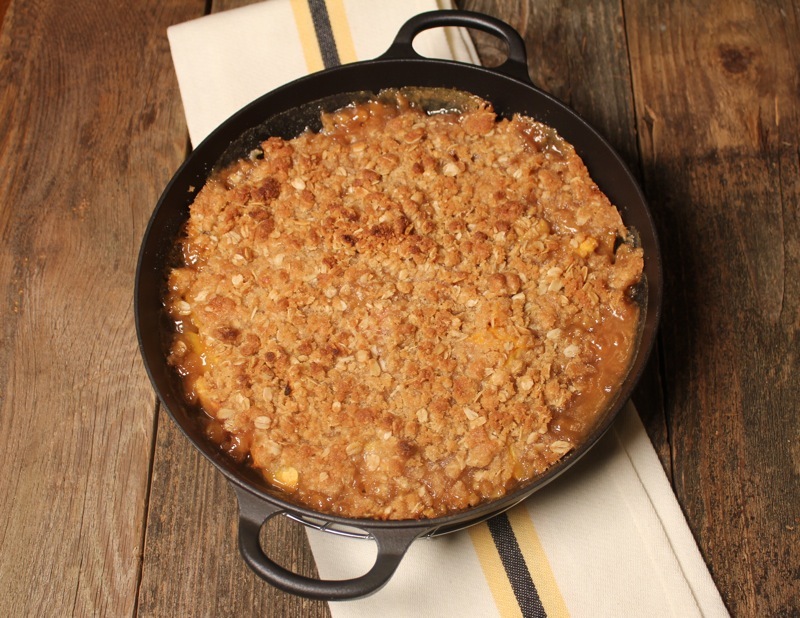 Peaches n’ Cream is a Southern tradition. Fresh peaches, sliced and topped with whipped cream are hard to beat. But I just entered the weekly contest over at Food 52 and we were asked to come up with a recipe for a cobbler, crumble, crisp, pandowdy or any other buttery topped fruit dessert. Since peaches are in season here in the South, that was my fruit of choice. The expression “peaches n’ cream” led me to the idea of cream in the dessert. But not just any cream. Bailey’s Irish Cream came to mind. I really liked this combination. 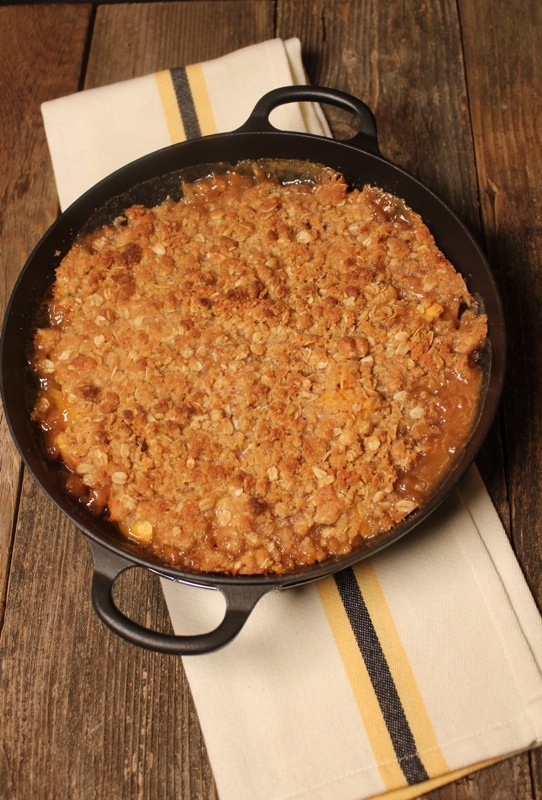 The Bailey’s Irish Cream added a rich note to the peaches but was not overpowering. The crumble topping was enhanced with a touch of cardamom and cinnamon. And if you add a dollop of whipped cream flavored with Bailey’s and sugar you will be a very happy camper indeed. No matter how well I do in the recipe contest, I am happy that I came up with this summer dish. 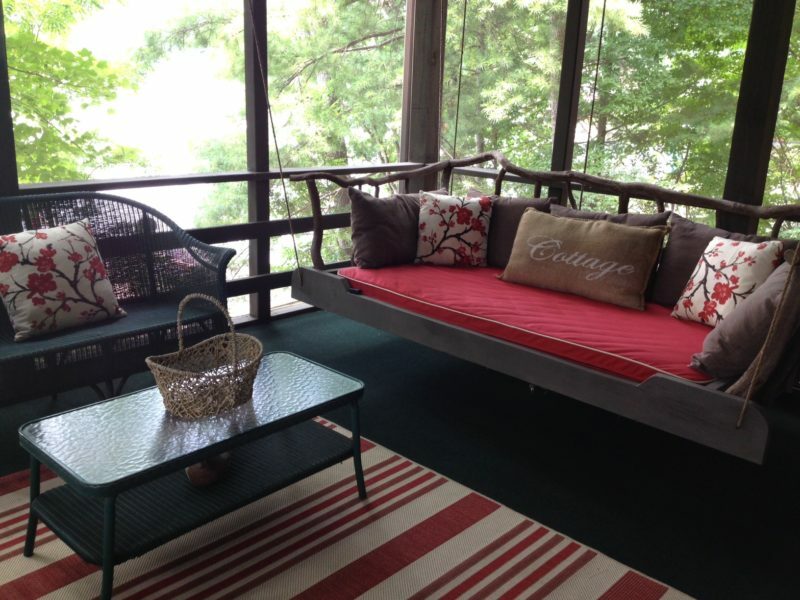 It is best enjoyed on a screened in porch after dark with a chorus of crickets serenading you. Preheat the oven to 375 degrees F. Butter a 9 to 10 inch pie plate or casserole. Place peaches in a bowl and mix with the Irish Cream, sugar and lemon zest. Turn mixture into prepared dish. Bake the crumble for 30 to 35 minutes. Let rest for 15 minutes and serve topped with whipped cream. Posted on July 15, 2013 at 2:39 pm. The weather is rapidly changing as both hurricane Sandy and Winter bear down upon us. 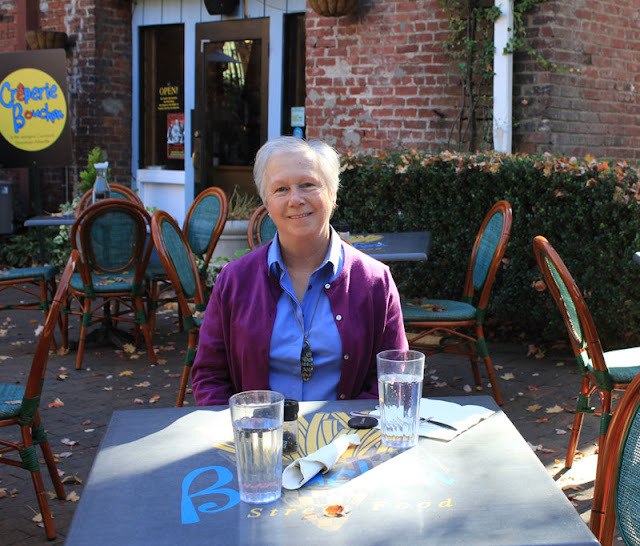 But last Thursday was a perfect Fall day in North Carolina. I baked these delightfully Fall tasting cookies after a day spent with one of my best buddies and blogging pals, the other Penny. Penny has two blogs now; her lifestyle blog, The Comforts of Home and her cooking blog, From Harvest to Table. We spent the morning in Asheville antiquing in the downtown area. It is so much fun to spend time with someone who shares your interests. We were both on the same quest. We were looking for props for our cooking blogs. After a successful morning of shopping we stopped for lunch at Creperie Bouchon. The leaves were falling and the dappled sunshine made eating outside delightful. Not even leaves falling into our crisp Sauvignon Blanc deterred us. 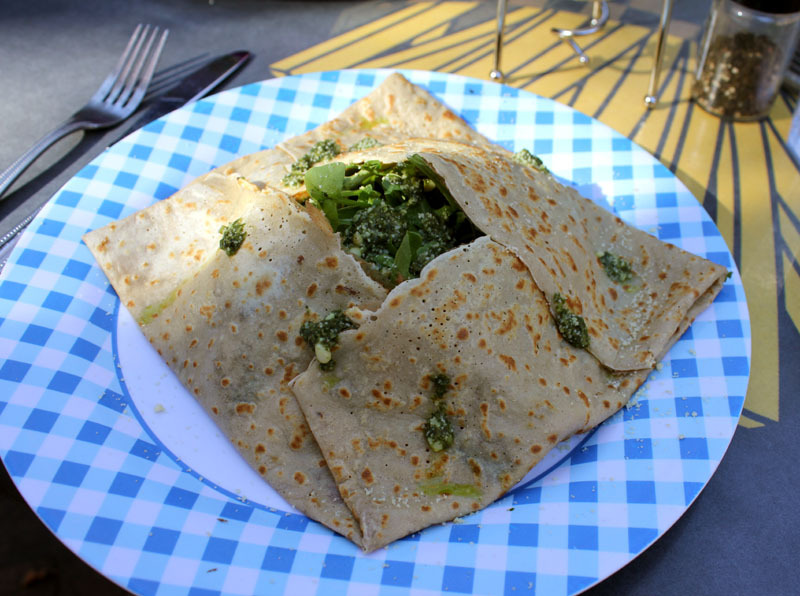 Our lunches of Pesto Chicken Crepes with arugula, tomatoes and Swiss were just right. 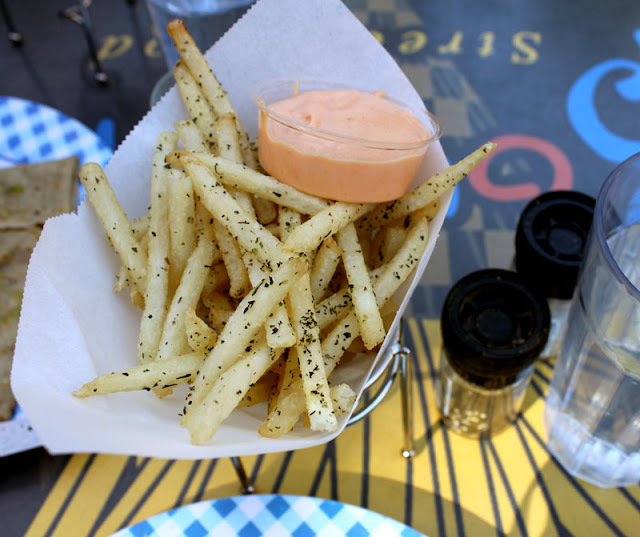 We couldn’t resist the frites dusted with Herbes de Provence and served with Roasted Red Pepper Mayonnaise. Perfect. One of my purchases was this cute blue polka dot plate. It pairs well with the milk bottle that I picked up in France this summer. 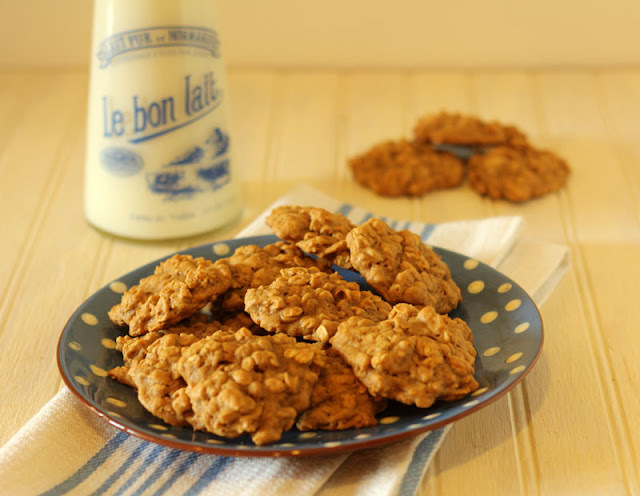 It inspired me to make these cookies with cinnamon spices, pumpkin and biscoff spread. I am cleaning out my pantry before my return to Florida and my jar of biscoff had just enough left in it. I found the recipe on the Two Peas and Their Pod blog. A perfect recipe for a perfect day. 1. Preheat the oven to 350 degrees F. Line a baking sheet with a Silpat or parchment paper and set aside. 2. In a medium bowl, whisk together the flour, baking soda, cinnamon, nutmeg, ginger, allspice, and salt. Set aside. 3. In the bowl of a stand mixer, add the butter and sugars. Beat until creamy and smooth, about 3 minutes. Add the pumpkin and Biscoff spread and mix until combined. Add the egg and vanilla extract and beat until smooth. 4. Reduce the mixer speed to low and slowly add the dry ingredients, beating only until blended. Stir in the oats. Posted on October 27, 2012 at 10:15 am.